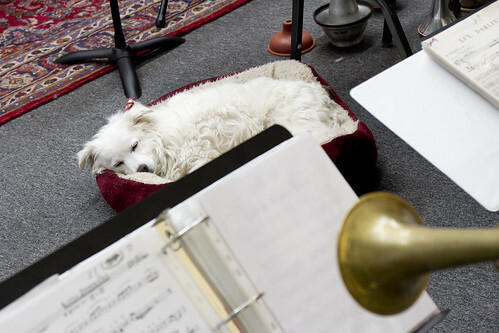 A curled bundle of white fluff lies motionless beneath the chair of trombonist Lindsey Williams. She taps her foot rhythmically in front of the American Eskimo mix's little black nose. His only stirring is the side to side movement of his eyes as he scans the room, surveying the assembled group of musicians. His ears hold steady as he soaks in the melody of "Summer Wind." He closes his eyes for a time as if to cherish the beauty of this moment. It is said that music has charms to soothe a savage breast. Jazzy may not be all that savage, but perhaps it is because of his musical intuition. 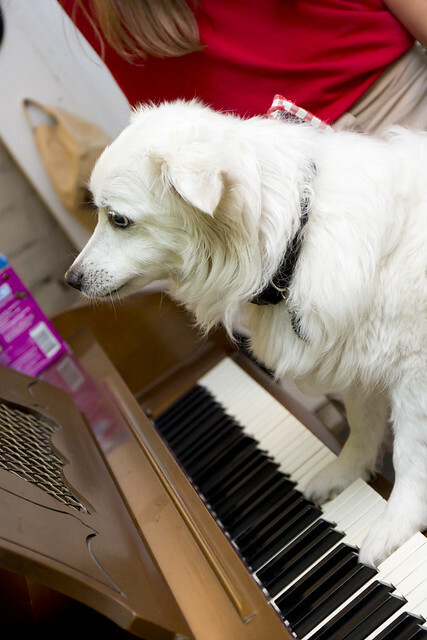 This thirteen-year-old pooch has been subject to and the the seeker of music most of his life. 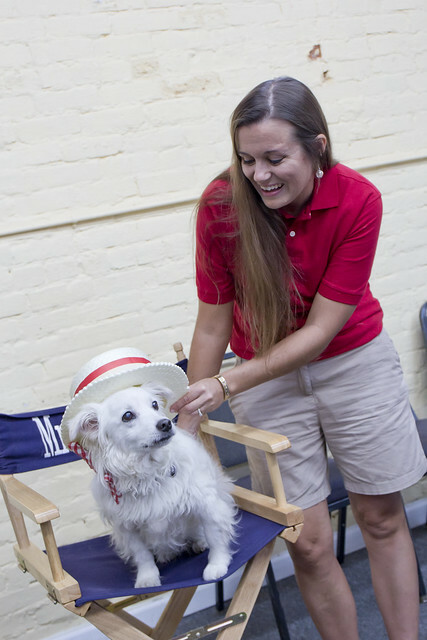 Lindsey, his owner, is the band director at Paducah Middle School. "I moved here for my first teaching job at McNabb elementary in 2003. My mom called me the second day I was here and said, 'I have this dog, and if you don't want him, I am going to keep him.' I said, 'Bring him down!' He was eight months old at the time. I worked two years at McNabb before going on to Paducah Middle." Lindsey regularly practices the trombone and piano at home, and from the beginning, Jazzy found bliss in the brassy tones and bright chords. Lindsey also noticed from the beginning that Jazzy was headstrong. When Lindsey joined Doug Van Fleet's new dance band in 2015, Jazzy decided he would as well. Lindsey couldn't change his mind. "I grabbed my trombone case to go to the Van Fleet Music Studio for rehearsal," says Lindsey, "and he decided he would dart out the backdoor with the sole intention of tagging along." Lindsey did everything she could to herd Jazzy back into the house, but he would have none of it. He remained insolent until she opened the car door. He then calmly climbed inside. "The first time, I was running late and really didn't have a choice," adds Lindsey. "I had chased him all around the yard. I finally said, 'Fine!' I wasn't sure if Mr. Van Fleet would allow him in the studio, and I did not want him to be a distraction; but Mr. Van Fleet told me to bring him on in. I had a dog bed in the car and placed it under my seat. Jazzy stayed there until the end of the rehearsal; and he's been coming ever since. He does keep a steady watch on the studio door, and he loves to greet the few females that are in the dance band!" 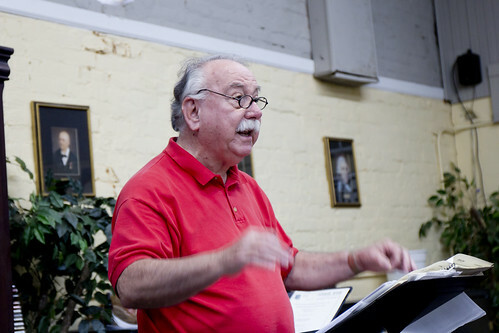 "He sits absolutely still during rehearsal," adds Mr. Van Fleet. "He sits right at her chair, and I don't care how loud the band gets, he listens and stays still. The trombone player beside her even brought a water dish for him. He's very content." 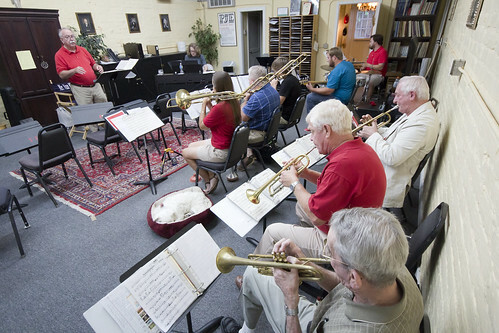 The band consists of members from ages fifteen to eighty-four, and all have fallen for Jazzy. "He's become part of the crew and part of the band," adds Lindsey. "He has a bowtie for performances and even a little armband for when we do polka." Jazzy loves being with people, and he is uniquely attracted to the music. "I have three other dogs now," says Lindsey. "Jazzy is the only one who will stay out for practice at home. The others want to go away. And in here, we're loud. It never bothers him. In fact, he wants to be in the middle of it all." And even though Jazzy appreciates multiple musical genres, he does seem to have personal preferences. "I think he likes Sinatra," says Lindsdey. "That dog has good taste!" laughs Mr. Van Fleet. "We're going to start doing "My Way" here pretty soon for him. "Well, that attitude of Jazzy—I do what I want—has become a theme around the house," says Lindsey. "My fiancé J.J. says the same about Paducah’s one and only, Mr. Van Fleet. With total respect of course, Mr. Van Fleet gets things done and is amazing in all he does! He has the highest standards! So J.J. says Mr. Van Fleet and Jazzy have that in common—they do what they want." And it is certainly clear what Jazzy wants. Next Tuesday, he'll lie in wait, watching Lindsey's trombone case. As she reaches for the handle, he'll dart for the door, ready to join his comrades in the dance band, ready to soothe his canine soul in the woven fabric of melody.